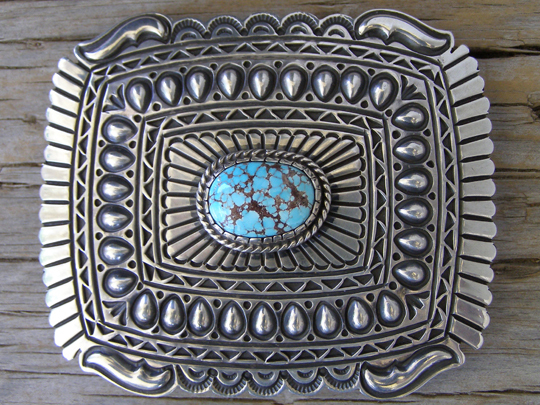 This rectangular buckle by Navajo smith Tsosie White is set with an oval of natural, untreated Timberline turquoise from Nevada. This small mine produces some fantastic turquoise. Stylized eagle feathers surround the stone and a series of concentric bands of stampwork radiate from the center to the sculpted edge of this slightly convex buckle. Classic! Hallmarked T.O. White and stamped Sterling on back. Dimensions of buckle: 3" x 2 5/8"